La pausa is a fundamental part of Argentine tango. It is that moment of calm suspense that, when done well, brings clarity to the dance by offering contrast and highlighting the range in the music enabling you to interpret greatly varying tempos. The suspension you need to be able to pause whenever you want or even need to is such a valuable skill that it's really worth training to be able to do it smoothly and seamlessly. Dancing tango is so much more relaxing when you know you can take a pause whenever suits you! ​Change your tango forever with alterations! These moves give a spontaneity and whoosh to your dance like no other step. We'll go into detail about the technique and timing you need to be able to seamlessly fit alterations into your dance. On this workshop you'll become familiar with many examples of different types of alteration and by the end of the day you'll be able to use them with grace and fluidity. ​Have you ever been unable to move at a crowded milonga? Everyone gets blocked in by other couples all round you on a busy dance floor from time to time so we're going to teach you all those lovely, small, close moves you can use to keep expressing the music and enjoying your dance even when there's no available space around you. There are so many expressive and creative ways of dancing tango without using much space and they're so useful to know to be able to get the most out of for social dancing and improve your floor craft. Come to the beautiful Norfolk countryside for an afternoon of fun and challenging Argentine Tango to accelerate and consolidate your learning. You'll be introduced to many new concepts and movements in three hours of workshops on the topic of "getting around each other" so be prepared to rotate, pivot, spin and go round in circles. We'll be teaching you the technique and developing in you the muscle memory needed to take your new skills away with you and on the the dance floor for evermore. Want to quickly make progress in your tango? Come to this fun and challenging workshop to boost your skill and enjoyment of tango whatever your level. At this workshop you will build a lasting muscle memory in the vital movements of Argentine tango which will give you the ability to really dance tango with elegance and flair. At any stage in your Tango journey you can get more out of your dance by improving your ability to isolate and dissociate. In this challenging and fun workshop Miriam Gita will show you how to achieve clarity and flow in your dance by finding, isolating and strengthening the right muscles. This intensive workshop focuses on developing the suspension needed to move smoothly and the skills required to dance decisively and achieve a flowing lead and follow. Six week course for Improvers including Tango, Vals and Milonga. Each class will start with 15 minutes of strengthening and flexibility exercises followed by a quick revision of the previous week's class. For those who have attended our classes or courses before you will know that we tackle with you a large number of tango elements at a time. We believe that coming back to them week after week reinforces them and perfects them more quickly. Then we will introduce these elements to various tango figures without labouring the figures, the idea being to perfect the technique rather than the figure. The class ends with a summary of what we have covered and an indication of what we might come across for the next week. ​The elements include Posture, Embrace, Connection, Walking technique, Indication, Isolation, Dissociation, Pivots, Planeos, the Cross, Ochos and Giros. We know that many of you will have come across each of these already so we will be looking at introducing them to your dance seamlessly and smoothly as between leader and follower. 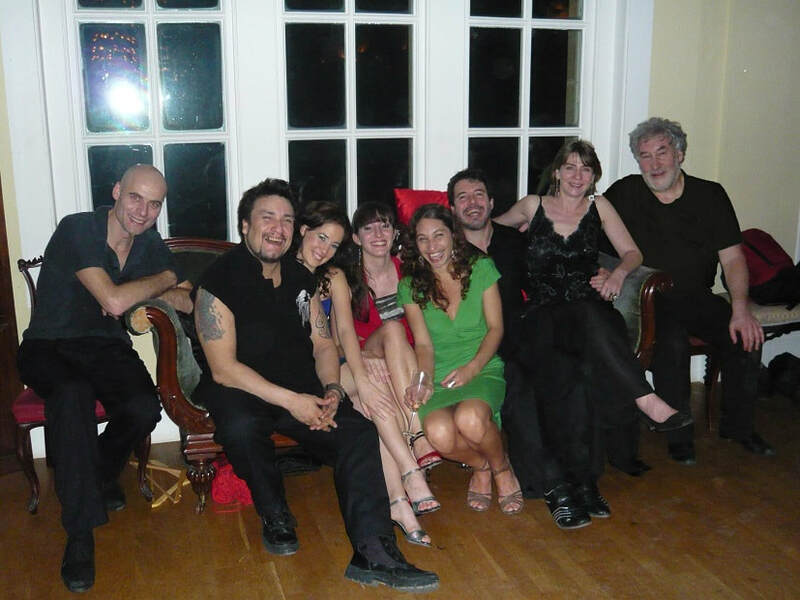 You are invited to an evening milonga to meet Carlos and Maria Rivarola and dance till gone midnight. 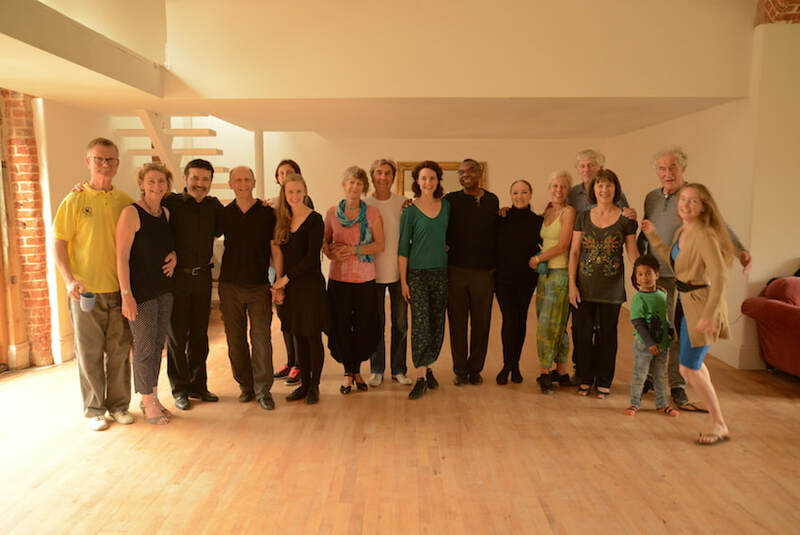 Famous for his roles in films including the Carlos Saura film ‘Tango’ the Rivarolas are giving a weekend of workshops and this milonga will be the highlight of the weekend. Carlos and Maria Rivarola are flying in early to England from their Russian tour in order to see the performance by dancer Miriam Gita and musician Adam Warne amidst the related art work of Stephen Vince on show at Mandels Gallery on Elm Hill, Norwich. The Art relates to an approach mentioned by Carlos when he was last here two years ago. Figures: The progression of the workshops slowly builds the muscle memory. Each workshop is carefully planned to follow on from the previous ones (at the moment it is still possible to 'jump in'). One ultimate aim for example is to achieve the giro perfect enough for the leader to enrosque (and for the leader to be able to enrosque). To include balance, dissociation, moving posture, embraces, the nature of the pivot and many more essentials. The object of this method of teaching is to ensure that you can get onto the dance floor sooner rather than later. NB. Workshops differ from Classes. Workshops are designed to instil these techniques etc into ones muscle memory - and so make the classes and dances even more fruitful. Free dancing if you arrive early - to warm up, practice with your partners and enjoy the atmosphere. ​ii. Dissociation - one of the most important abilities. iii. Abrazos - embraces - getting comfortable with each new partner before dancing and the different tango possibilities from each embrace. iii. A number of examples to include in tango dance incorporating these techniques. ​Workshops on how to Improvise to the music in Tango, Vals and Milonga. ​Music. How to hear the 'beat' in tango music and the 'pause'. ​Technique. We will work from the concept of being grounded, the quality of each step, the embrace and how to give Intention for Leaders and how to recognise it for Followers. The content of this workshop may seem like revision for some. However, it is essential to the degree of success in the following two workshops. ​Music. How to recognise some of the different types of rhythm in tango, vals and milonga and how these rhythms can give more options within your dance. Technique. We will continue to the pivot for both Leaders and Followers. We will look at where the energy comes from for the pivot, that is, what drives it. How to give the Intention for the pivot in both the ocho and the giro. Music. Without loosing sight of the 'beat' and the rhythm, we will look at the Colour of the music and how that affects our options. ​Technique. We will look at such things as Amargue and Change of Direction in the natural soft creation of soft Voleos, Sacadas and Ganchos. iii. To be able to dance freely with both the music and one’s partner. This sounds technical but it isn’t. It sounds advanced, but can be absorbed at any stage. It is as exciting for Intermediates as it is for Beginners for two people to be able to improvise to the music as if they were just one person. We will work on a full awareness of one's body, axis and balance, working from the centre and the way the leg moves in particular the foot and its angles. In brief, we will work on the dynamics of motion as applicable to the dynamics within the music. This will involve a very close analysis of the music to discern where the 'beat' is and to identify the various rhythms. And how this knowledge can add to the nature of each step, that is, the space between. Spatial Orientation. How to adjust the space one shares with one's partner to harmonise with the other dancers on the floor. How to modify one's own dance smoothly and naturally.